Recycling wood pallets for room furniture is a terrific idea. Turning useless used items into functional and eco-friendly products for home decorating helps protect the environment and create unique home furnishings. There are many innovative and impressive ways of recycling wood pallets. They help design modern chairs, tables, living room sofas, wall shelves, home organizers, and even lighting fixtures. 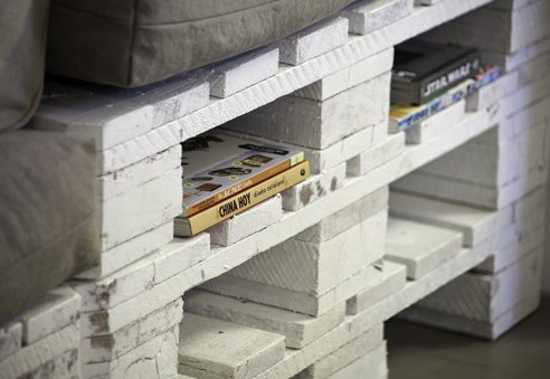 Here is a smart, playful and amusing DIY idea: recycling wood pallets for a huge family room sofa. The design is perfect for creating a home theater or a family room for a big party. The sofa bed helps comfortably accommodate all your guests, your kids, and their friends in a cheap and creative way. The large sofa design is an excellent idea to reuse and recycle wood pallets available from a local home improvement store or warehouse. Wood pallets are cheap. Room furniture designed out of rough wood palettes is original and eco-friendly. Wood pallets are made of the high-quality untreated material which brings beautiful texture and great opportunities for interior decorating. You can sand them, then stain or paint them for a nice look of handmade home furnishings, but the originality of DIY furniture is worth the effort and time. The multi-level sofa beds are comfortable and inviting. Adding large soft pillows turns the simple wood frames into the unusual, comfortable and modern furniture with convenient storage spaces and sturdy structure. Wood pallets are a perfect material for creating beds, sofas, coffee tables, and storage shelves in your living room or any room in your home. DIY chairs and sofas made of wood pallets are multifunctional home furnishings which are stylish, functional, and eco-friendly. They provide seats and storage for organizing books, magazines, gadgets, small pillows, and throws. DIY wood furniture is a great idea to personalize your living spaces and protect the planet.